How do you solve the world’s toughest challenges? One way is the launch the world’s largest student competition. That’s the idea behind the Hult Prize, which is designed to get students at universities around the world thinking about business solutions to global problems. The winners get $1 million and the chance to bounce their social enterprise startup ideas off some of the brightest minds in the international business community. 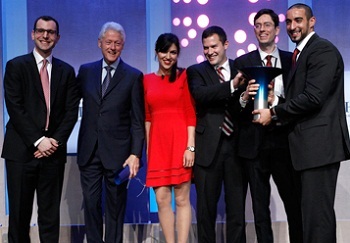 The Hult Prize is presented in partnership with the Clinton Global Initiative and focuses on a particular problem chosen each year by former President Bill Clinton. In his 2014 President’s Challenge, Clinton is asking the teams of four or five students to “build sustainable and scalable social enterprises to address non-communicable disease in urban slums.” And, to top it off, the challenge calls for all this to be completed by 2019. Among 10,000-plus applicants this year, more than 200 regional finalists have been selected. The next round of competition will begin in March in Boston, San Francisco, London, Dubai, Shanghai and Sao Paulo. Winners there will spend the summer at the Hult Prize Accelerator, where they’ll hone and then make their final pitch. The ultimate winner will be named in September. Previous challenges were “One Laptop Per Child” in 2010; “The Clean Water Crisis” in 2011; “Global Poverty” in 2012; and “The Global Food Crisis” in 2013. Clearly, these are all complex issues. This year’s challenge, however, might be the most complex yet. Slums are informal, many times illegal, settlements. Residents can’t typically depend on government services; in fact, slums exist because of government failure. The non-communicable diseases that dominate in the slums are cardiovascular disease, cancer, chronic respiratory disease and diabetes. In other words, the same diseases the rest of world struggles with. The difference is people living in slums sometimes don’t even officially exist and haven’t been able to count on consistent help from governments or NGOs. Social enterprises – with their focus on sustainability as opposed to donations – might be the best hope. And who better to come up with promising social enterprises than promising young people, undaunted by legacies of failure and Hult’s challenge to “tackle grave issues faced by billions of people”? Past winners of this prize have been amazing. We can’t wait to see what solutions the students come up with this year. Speaking of solutions, the three finalists for this year’s World Design Impact Prize have been announced, and two health care ideas are included: the ABC Syringe and the BioLite HomeStove (see below). The winner will be announced Feb. 28.